You're Invited to First Friday's! For each of our clients we strive to help create financial stability and security to provide financial independence. Strong Retirement Income Solutions referred to herein as named investment advisor is not affiliated with Platinum Advisors LLC or FMG Suite. All content herein is general in nature and provided for informational purposes only. Please contact us directly for information regarding your specific financial situation. 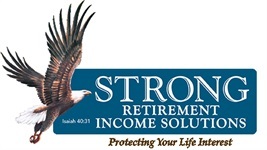 Strong Retirement Solutions is also known as Strong Financial Services, Inc.